You’ve heard the moving horror stories. Moving companies doubling prices on moving day. Movers asking for more money before they’ll unload the truck. Yes, some moving companies are sketchy and you need to do your research upfront to avoid them. Did we mention we have a list of the best long distance moving companies and a guide on how to verify a moving company is reputable? But even if you’ve picked a high-quality moving company and locked in a firm estimate, there are still legitimate ways a mover can charge you more money during the move. Some of these costs are due to unavoidable circumstances. But more frequently, additional charges occur due to poor planning. Regardless of the situation, you need to be aware of any possible scenarios where you might have to fork over a little more cash. Let’s start by taking a look at the most common quote increaser. We know, we know, this will never be you. But far too many people underestimate the time required to pack all their stuff. After all, you aren’t just packing. Moving entails cleaning, sorting, reminiscing, lining up a new place to live, switching utilities, etc. etc. If you aren’t ready when the movers arrive there’s a good chance your move is going to take longer than estimated. And, this means you’ll be coughing up more cash than expected. Those who budget more time for packing will be forever grateful. When a mover provides an estimate they’ll typically point out glass table tops, TV’s, fine china, mirrors, pictures, and any other delicate items. Now, if you’re having the moving company pack or crate these items then no worries. But, if you plan on prepping delicate items yourself, you need to pay close attention to the mover’s packing requirements. Especially for long-distance moves, movers want fragile pieces packed well. The last thing the driver needs is glass all over the floor of his truck. 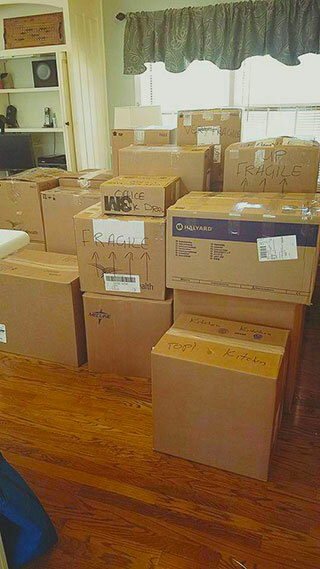 On moving day, if delicate items aren’t properly packed and padded most moving companies will ask to repack the item. And guess what, adding packing charges the day of your move ain’t cheap. Either coordinate with movers ahead of time to have them pack anything fragile or take the time to prep items properly. This one is pretty straightforward but happens often. That sectional couch you thought you were going to donate. Or that shelf of books you just couldn’t bear to part with. For local moves, a few extra items might not be a big deal. But for interstate moves, moving companies will charge you for any items that weren’t listed on the original estimate. And extra items can start to add up quickly in additional costs. The best thing to do is always keep your movers updated with any changes and use the price differences to decide what’s worth moving. Those who overcommunicate have fewer unpleasant surprises. It’s not uncommon for customers to have items scattered in other locations like storage units or relatives’ houses. Usually, they plan on consolidating all these items at the main residence prior to the movers arriving. But as the chaos of moving day approaches, they forget or run out of time. For local moves, extra stops increase the overall time to complete the move making the move more expensive. However, for long-distance moves, extra stops are treated as an added service. Movers typically charge around $100 depending on the distance from the primary residence. Of course, you should always let your movers know about extra stops ahead of time. This is a less common scenario but occasionally on long distance moves a customer can’t receive their shipment and require unexpected storage. Now I know you’re saying, that’s definitely not me, but sometimes storage can’t be avoided. Like I said, less common but these scenarios do happen. The best thing to do is always get a quote from the mover for storage so you know the cost ahead of time. Hope for the best but always plan for the worst. Issues like narrow streets, sharp turns, low hanging trees or power lines and tight parking can sometimes prevent large tractor-trailers from parking at the residence. When this happens, a smaller, “shuttle” truck is brought in to complete the move. Shuttles are fairly common and the costs are normally built into the quote. But, if you don’t have a destination address at the time of the quote or if the access at the destination is iffy, a shuttle fee may have to be assessed during the move. And shuttles can cost a lot of money. It’s basically an additional move from the larger truck to the smaller truck and that requires a lot of extra labor. Costs can range from a few hundred to thousands depending on how large the move is. Regardless of your situation, you should always ask what a shuttle will cost if needed. It’s better to know ahead of time any potential additional costs. Some of the larger, national van line moving companies pool money together to cover destination shuttles when necessary. Be sure to ask your move about the potential for a shuttle and get an estimate on what it will cost. Alright, that about covers it. If you have additional questions let us know in the comments!